Another lazy day in Carefree is just what I needed. We went to breakfast at Fluff’s favorite coffee shop. It was rather crowded for a late morning on a work day. The shop had an inside and outside counter with barstools, an outside patio, a few lounge chairs and a few inside tables. It also had four beers on draught because a few nights a week they have live music. We chose coffee and a breakfast sandwich this morning and ate at the outside counter so Petey could hang out with us. As we chatted about where I was headed next, Fluff informed me a section of Hwy 1 in California had washed into the ocean! I didn’t know that. I will have to do a little more rerouting of my trip. Before we left, a biker came in with his cat on a leash (I’m glad Petey was outside). That’s the second cat on a leash that I’ve seen on my journey so far. The other was at a campground in West Texas. On the way back to the house, we made a quick stop at the resort to take a peek at the main room and dining room. Fluff said, “You’ve hardly seen anything since you’ve been here, and your mom is going to ask, did you see this? What about this?” It was fine with me to “not see much”, though I felt like I saw quite a bit. 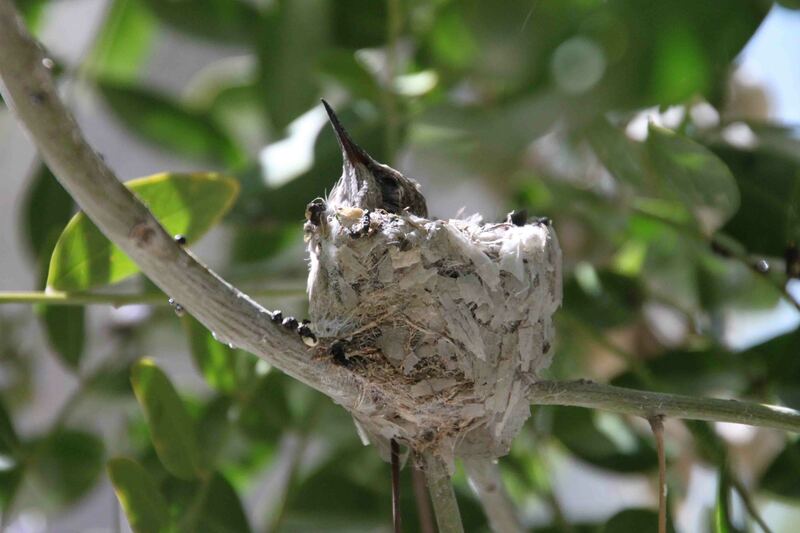 Besides how many people can say they’ve seen a baby hummingbird in its nest? In addition, I planned for more down days on this leg of my journey just to rest and address odds and ends that come up. And, anyone that knows Fluff and Charlie, knows it’s just plain FUN to sit and chat with them. We lounged around the house waiting on VANilla. The mechanic in Scottsdale was supposed to have it ready by noon. Unfortunately, they ordered the wrong parts. So with that, we decided to do a bit more wandering as VANilla wouldn’t be in tip top shape until late afternoon. We strolled around the shops and restaurants in Carefree and stopped at the Sundial, the largest in the USA. Judging from the shadow created by the Sundial, it was around 2 o’clock. Also, I picked up a nano geocache hidden in the area. Hidden in plain sight, it blended in quite well. As we headed to Big Earl’s for a milkshake, I got the call…VANilla was anxiously waiting to continue our journey. PS. Fluff and Charlie, thank you for a wonderful visit! getting things ready when Bart and I were visiting Fluff and Charlie. you got to see this! Nature at work! I’m so glad you got a great visit in with Fluff and Charlie. They are simply the BEST! Sounds like you saw a lot of the “stomping grounds” I like to visit when I’m there. And, I love Big Earls! Hope your shake was delicious!